Is The California Court Case Management System (CCMS) Being Misused For Politics In Policy & Litigation…..And The Fleecing Of The California Taxpayer Over The Mold Issue? Could someone please explain to us why an author of fraudulent medico-legal policy over the mold issue for the US Chamber of Commerce with strong ties to the US Centers for Disease Control and Prevention, National Occupational Safety and Health Division (“NIOSH”) has been an undisclosed party to a Strategic Litigation Against Public Paticipation (“SLAPP”) for six years…and the California Court Case Management System (“CCMS”) has been altered and falsified to conceal this? 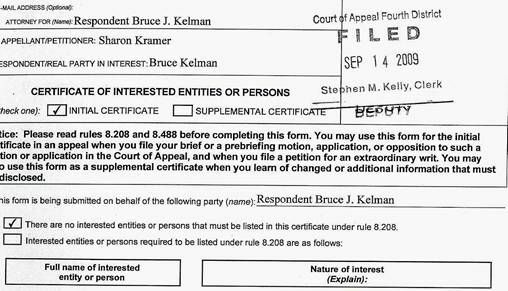 09/14/2009 Certificate of interested entities and parties filed by: Plaintiff and Respondent: Kelman, Bruce J. Attorney: Keith Scheuer Plaintiff and Respondent: Globaltox, Inc. The Remittitur after appeal issued on December 20, 2010. 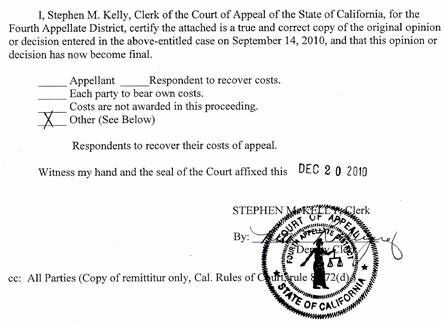 Signed by the Clerk of the Court, Stephen Kelly’s hand, and the seal of the State of California it states plural “Respondents” on appeal. Who are “et. al.”? Who are “Respondents”?…. Who killed Jon Bonet? As a principal of GlobalTox, this is the second time Bryan Hardin was an undisclosed party on appeal. The California courts have known since June 2006 that Hardin, (who was the link in the George Bush years between the US Chamber of Commerce, CDC NIOSH and the American College of Occupational & Enviornmental Medicine (ACOEM) in mass marketing misinformation over the mold issue), has been an undisclosed party to this SLAPP litigation over the mold issue and public health. This, as the courts framed for libel, the first person (c’est moi) to publicly write of how the above named entities were connected to market the fraud. This has been used to discredit all my words – not just the five for which I was sued, “altered his under oath statements”. This shameful misuse of the courts, by the court, to practice politics has aided the scientific fraud in policyto continue. I.e., that it had been scientifically proven moldy buildings pose little to no health threat. It is indicative that the leadership of the California judicial system has become the epitome of what courts are meant to protect against. If a superior court keeps a computerized Case History, then that would seem to be a court record that would be presumptively subject to public access, and governed by laws that control accurate recording. California law defines “judicial record” as “the record or official entry of the proceeding in a court of justice, or of the official act of a judicial officer, in an action or special proceeding” Code Civ Proc 1904. A CCMS Case History would seem to fall within this definition of entries made by clerks of the court and therefore qualify as a judicial record to which parties to a litigation and public right of access attaches. This is particularly relevant in a litigation involving public health and public policy impacting hundreds of thousands of lives and where entries in the Case Summary that are available for litigant view are evidenced false entries. Yet, County Administration of the San Diego Court indicates the court legal department states CCMS Case History data entries are not available to be accessed by parties to the litigation or by the public – even when errors are known to be present in the CCMS Case History. “I am a whistle blower of how it became a fraudulent concept in US public health policy in the early 2000s’ that it was scientifically established moldy buildings do not harm. I am the catalyst that caused a Federal GAO audit over the issue in 2006, which has aided tremendously to remove the fraud from Federal policy. My co-writing on the blog, Katy’s Exposure, was recently cited as reference for a Federal OSHA occupational safety publication over the mold issue in April of 2011. I am published in medical journals regarding the marketing of misinformation over the issue in the medical community and to the courts. My endeavors to reshape public health policy have been beneficial to public health, but adverse to the interests of those who sell doubt of causation of illness for a living and their clients; such as the insurance industry. In October of 2005, Governor Schwarzenegger endorsed the fraudulent concept into California Workers’ Compensation policy under the platform of Workers Comp Reform — that it had been proven moldy work environments pose little to no health threat to workers. He instructed that occupational physicians must adhere to the guidelines of ACOEM over the mold issue. This has aided many California workers comp insurers to be able to shift the cost burden of worker injury onto the taxpayer funded, state and federal disability and social services, when insurers have a bogus legitimizing factor written into policy aiding them to deny financial responsibility…. Unfortunately, some of the judiciaries and court clerks involved in this fiasco of aiding this fraud in policy to continue are leading judiciaries and court officers in the state of California. They are present and past members of the Judicial Council. They have aided the continuance of an Insurer Cost Shifting scheme (that was endorsed by Governor Schwarzenegger) by being willing participants in a malicious, strategic litigation carried out by criminal means. CCMS is being used by the clerks to conceal the judiciaries’ “indiscretions”…..
Is this the intended usage for a computer system that will eventually link all courts in California and will be the electronic record of all legal cases? In its current form, CCMS is a blank slate that is asking for special and conflicted interests to be able to enter false data into the Court Records, some that only the courts see, should the motivation and opportunity arise. As such, I am requesting that the Judicial Council review the Court Records, including those that are in the CCMS, in Kelman & GlobalTox v. Kramer Case No GIN044539 San Diego Superior Court, Kramer v. Kelman Defendant/Appellate v. Plaintiff/Respondent, Fourth District Division One Appellate Court D054496. This is needed to help the Judicial Council understand how their computer system can and is being used to aid judiciaries who chose to breach their judicial vows to practice politics instead of law; and how their clerks are able to add, edit, delete, remove and falsify CCMS records in the Case Record in violations of GC 6200, while aiding to conceal of the actions of the compromised judiciaries…. READ THE ENTIRE LETTER HERE…. TO: Justice Judith McConnell, Chair of the California Commission On Judicial Performance. “As the Presiding Judge of the San Diego Appellate Court, please take measure to remove the Government Code 6200 Clerk of the Court violations from the Case Record, CCMS Case Summary & Docket, and Case File. Please evidence for me when these corrections are made in accordance with Government Code 62150(d)…. I made no such accusation. My purportedly libelous writing of March 2005 speaks for itself and is a 100% accurate writing. It accurately states the exchange of money from the Manhattan Institute think-tank was for the US Chamber’s mold position statement, ACOEM’s was a version of the “Manhattan Institute commissioned piece”. As written by McConnell and accurately stated in my writing, Kelman admitted being paid by the think tank to author a paper for the US Chamber of Commerce, only after a prior testimony of his from another case in Arizona came into an Oregon trial proceeding. From there, he flip flopped back and forth and tried to say ACOEM’s mold statement was not connected to the US Chamber’s while having to admit they were — because his Arizona bench trial testimony proved they were. READ LETTER TO JUSTICE MCCONNELL HERE…. Justice McConnell, you and many others have this video including the California Commission on Judicial Performance and the Chief Trial Intake Division of the California State Bar. Judge Enright was made aware of where to view it on the net in 2010. The Appellate Panel of you, Irion and Benke have the transcript of the depositions specifically called out for you in Briefs and Appellate Appendix. “There are false entries made in the ROA stating a date of judgment that is not supported by the Case File. There is an ROA entry after the Remittitur issued, falsely stating who were the Prevailing Parties. There are documents of judgment of which I was noticed that are not in the Case File. There are documents of judgments of which I was not properly noticed under CCP 664.5(b) that are in the Case File. There is an Abstract of Judgment in the Case File, based on a not valid and not properly noticed entry of judgment. There is a judgment lien on my home based on this void Abstract of Judgment. As you are aware, this has been a very ugly case over a matter of public health, that has cost me everything I own to defend the truth of my words for the public good. It just keeps getting uglier. Attached is a rather lengthy and direct letter to the Clerk of the Appellate Court, Stephen Kelly and the Clerk of the Superior Court, Michael Roddy. As the Presiding Judge of the San Diego Superior Court, please take measure to remove the Government Code 6200 Clerk of the Court violations from the San Diego Superior Court Case Record, CCMS ROA & Case History, and Case File. Please evidence for me when these corrections are made in accordance with Government Code 62150(d). I am also requesting of you and Clerk of the Court, Michael Roddy, that I be provided access and a copy of the complete CCMS Case History – not just those items that print when I request a copy of the ROA. This is not a sealed case. I am aware that there are incorrect entries in the Case History that do not print on the ROA. The Case History is the CCMS Court Record that is shared among the judiciaries and court personnel. It is a violation of my First Amendment Rights and prejudicial to me as a litigant, that judges are seeing inaccurate information of which I am not even permitted to see – or know what all they are seeing in the CCMS to be able to challenge the CCMS entries as incorrect. Appellate Court: Erred December 20, 2010 Remittuter; Altered & erred entries in Appellate CCMS Case History, Awarded costs to undisclosed parties on Appeal, States false judgment date in Case History. Issued a Remittitur based on a back dated Superior Court Proof of Service that was certified signed and mailed by a San Diego Superior Court Deputy Clerk of the Court. Superior Court: Altered and erred Register of Action entries &; “stealth” Case History in CCMS. Issued an Abstract of Judgment in violation of CCP 664.5(b). Back dated a Proof of Service of a Minute Order that was certified, signed and mailed by a San Diego Superior Court Deputy Clerk of the Court. This is going to be a very direct letter. Errors, deletions, additions and false entries in your respective Court Records have caused me extreme financial damage and much distress. They have aided and abetted a malicious, strategic litigation carried out by criminal means; and over a matter of public health. They have aided to conceal the judiciaries for whom you clerk or oversee their Deputy Clerks have been participants in the malicious, strategic litigation; and have been playing fast and lose with the law. Their actions and your actions have aided to defraud the California taxpayers by aiding with the continuance of an Insurer Cost Shifting Scheme, written into California Workers’ Compensation policy by ex-Governor Schwarzenegger in October of 2005. While certain judiciaries in California appear to enjoy the privilege of being above the law; the same privilege is not afforded to Clerks of the Court or their Deputies. Under Government Code 6200, it is a criminal offense to alter, falsify, remove and/or secrete Court Records. These are not actions in accordance with Government Code 68150(d)…. There are incorrect Court Clerk entries in the (“Court Record”), (“Case File”), Register of Action (“ROA”), (“Case History”) and Court Case Management System (“CCMS”) of the San Diego Superior Court libel case of Bruce J. (“Kelman”) & (“GlobalTox”), Inc., v. Sharon (“Kramer”). There are incorrect Court Clerk entries in the Court Record, CCMS, Case File, (“Case Summary”) and (“Docket”) when on appeal in the Fourth District Division One Appellate Court, (“Kramer v. Kelman”) Defendant/Appellant v. Plaintiff/Respondent…. Which is it? A judgment was entered on December 12, 2008 and Presiding Justice McConnell accepted my intent to appeal on January 14, 2009 in violation of Rules of the Court 8.751? Or a judgment was not entered on December 12, 2008, and the Appellate Case Records are violations of Government Code 6200 stating a judgment that was not entered –with the lower court records made to match after the Remittitur issued in December of 2010? “ROA #264 12/23/2010 Remittitur (Judgment of 12-12-08 is affirmed) filed by The Superior Court of San Diego. The case is still pending. The presiding judge has not signed off. Prior to the false editions and additions on December 23, 2010, in the Superior Court CCMS (after the Remittitur – stating undisclosed “Respondents”, isssued back with an Appellate Opinion stating date of entry of judgment of 12/12/08) there was no entry in the lower court ROA showing any judgment was entered on 12/12/08…because there was not. Odd how both CCMS histories of this case are consistent in their incorrectness with neither matching the Case File. Rather than attach and mail a mountain of evidence to an already lengthy letter, I am going to put this letter to you, the Clerk of the Fourth District Division One Appellate Court, Mr. Kelly; and Clerk of the San Diego Superior Court, Mr. Roddy; online. I will link to the evidence of errors, alterations and false documents in your Case Records that need to be corrected under Government Codes 6200 and 68150(d). As Clerks of the Court and members of the California Judicial Council; how you choose to address the needed corrections of errors, falsifications, additions, deletions, and secret & false entries in the CCMS Case History in your Court Records will answer the questions raised in the blog title regarding your intended usage of CCMS. If I have any errors or misstatements of fact in this letter, please let me know so we (the owner of the blog and I) may then correct the online version. My apologies for typos in this letter. I do not type well and can no longer afford to hire a typist directly because of the mishandling by the courts of this case. I currently have an interest accruing judgment lien on my home for costs incurred by a party I prevailed over in trial (with one being an undisclosed party), based on a false judgment never properly entered or noticed; false abstract of judgment; false Remittitur awarding costs to undisclosed parties on appeal. I am gagged by the court from writing a sentence for which I was never sued – which, coincidentally, would gag me from writing of what the judiciaries and their clerks in this case have done that aids abets insurer fraud and the fleecing of the public…. I am not going to shut up. I am not going to go away until someone acknowledges that every single judge and justice to oversee the case of Kelman & GlobalTox v. Kramer ignored the evidence that Bruce J. Kelman, author of medico-legal policy over the mold issue for the US Chamber of Commerce and ACOEM, committed criminal perjury to establish needed reason for malice while strategically litigating against public participation against the first person, Sharon Kramer, to publicly write of how these papers were connected to mass market a scientific fraud in US health and California workers’ comp policies. This, as the courts FRAMED ME for libel. False Clerk of the Court CCMS entries of judgments never entered, parties never disclosed as the judiciaries practiced politics, not law, are aiding and abetting insurer fraud in violation of Government Code 6200. That is criminal. When this is acknowledged, the fraudulent concept in public health policy that it has been scientifically proven all claims of illness from the toxins of mold found in water damaged buildings are only being made because of “trial lawyers, media and Junk Science” will immediately cease. Lives will instantly be saved…. 1. Either provide evidence from the Case File on Appeal that GlobalTox and the owners of the corporation where disclosed as parties on appeal on the Certificate of Interested Parties stamped received on September 14, 2009 by the Clerk of the Court or Remove the word “Respondents” and “et. al” from the December 20, 2010 Remittitur, evidence and date its removal; and send me proof when removed. 2. Either provide evidence from the Case File on Appeal that GlobalTox and the owners of the corporation where disclosed as parties on appeal on the Certificate of Interested Parties stamped received on September 14, 2009 by the Clerk of the Court or Remove from the CCMS Docket that GlobalTox’s name was on the Certificate of Interested Parties, September 14, 2009; evidence and date its removal; and send me proof when it is removed. 3. Either provide evidence from the Case File on Appeal that a judgment was entered on December 12, 2008 or Remove from the CCMS Docket that a judgment was entered on 12/12/08, evidence and date its removal; and send me proof when it is removed..
4. Provide the dated, file stamped, signed, and noticed legal judgment document that gave the Appellate Court jurisdiction to hear the appeal. 5. The Appellate Court was provided evidence that Kelman committed criminal perjury in his declarations, three times, to establish needed reason for malice. Quote, “I testified the types and amounts of mold in the Kramer house could not have caused the life threatening illnesses she claimed” The Appellate Court was evidenced that Scheuer suborned Kelman’s perjury, even in his Appellate Brief of September 2009. His theme in his briefs: “Apparently furious that the science conflicted with her dreams of a remodeled home, Kramer launched into an obsessive campaign to destroy the reputation of Dr. Kelman and GlobalTox”. Either provide evidence from the Case File on Appeal that corroborates the stated reason for malice or cease and desist with using the CCMS in violation of GC6200 to conceal that all judges and justices overseeing this case rewarded a plaintiff’s criminal perjury to establish needed reason for malice while strategically litigating. 6. The Appellate Court was provided evidence that I found Kelman’s testimony when retained as an expert witness in Oregon of flipping back and forth to describe the relationship of the ACOEM & US Chamber mold statements from “lay translation” to “two separate papers, two separate works” and back to “translations” to be “altered under oath statement”. Either provide evidence from the Case File I was ever impeached as to the subjective belief in the validity of my words or cease and desist with using CCMS in violation of GC 6200 to conceal that all judges and justices overseeing this case deemed a never impeached US citizen to be guilty of being a malicious liar. 1. Either provide evidence from the Case File that a judgment was entered on December 12, 2008 or Remove from the stealth Case History that a judgment was entered on 12/12/08, evidence and date its removal and send me proof it is removed. 2. Either provide evidence from the Case File that a judgment was entered on September 24, 2008, was filed stamped, signed and noticed under CCP 664.5(b) to both prevailing parties or Remove from the CCMS ROA and Case History, Abstract of Judgment that there was a legal judgment entered on September 24, 2008, evidence and date its removal and send me proof it is removed. 3. The courts were evidenced that Kelman submitted and was awarded costs that were incurred by GlobalTox in the amount of $3,626,33. Either provide evidence from the Case File to refute that the courts awarded costs to a party, not incurred by the party, or Remove from the CCMS stealth Case History that an amended judgment was properly entered awarding Kelman $7,252.65 on 12/18/08, evidence and date its removal; and send me proof it is removed..
4. On the Minute Order dated December 12, 2008, it states, “The Record in this case reflects that Plaintiff Bruce J. Kelman is the prevailing party solely as against Defendant Sharon Kramer. Defendant Sharon Kramer is the prevailing party solely as against Defendant Globaltox, Inc.”. Provide evidence from the Case File that the Amended Entry of Judgment dated 12/18/08 (after the Minute Order was finalized) states both Kelman and Kramer are prevailing parties) was entered. 5. Either provide evidence from the Case File that Kelman and GlobalTox were the prevailing parties or Remove from the CCMS ROA and Case History that Kelman & GlobalTox were the prevailing parties as falsely entered in the ROA and Case History on December 23, 2010, evidence and date its removal; and send me proof it is removed. 6. Either provide evidence from the Case File that Judge Maas, now presiding judge over this case affirmed on December 23, 2008, that a judgment was entered on December 12, 2008 deeming Kelman and GlobalTox to be the prevailing parties or Remove from the CCMS ROA and Case History that on December 23, 2010, the lower court presiding judge quote:“the Remittitur (Judgment of 12-12-08 is affirmed) filed by The Superior Court of San Diego”. Evidence and date the removal; and send me proof it is removed.
. 7. If is evidenced by the Case File as legitimate CCMS entries, Add back the deleted entry #183 thru #187 made between October 23 & October 28, 2008, to the ROA and Case History; evidence and date their addition; and send me proof if and when they are added back..
8. Either provide evidence from the Case File that a Judgment was entered on September 24, 2008; or Rescind the Clerk of the Court issued Abstract of Judgment that was entered on December 31, 2008, stating a date of entry of judgment of September 24, 2008. This is a further abuse and violation of Code of Civil Procedure 664, 664.5(b) and Government Code 6200. Send me proof when the Abstract is withdrawn. 9. Provide from the Case File, the dated, file stamped, signed, and noticed legal judgment document upon which the December 31, 2008, Abstract of Judgment is based awarding Kelman $7,252.65 in costs (plus one dollar). 10. Provide from the Case File, the dated, file stamped, signed, and noticed legal judgment document as it appeared prior to the Entry of Amended Judgment dated 12/18/08, after Kelman’s costs were submitted in October 2008. Rule 8.208. Certificate of Interested Entities or Persons (d) Serving and filing a certificate (2) If the identity of any party or any entity or person subject to disclosure under this rule has not been publicly disclosed in the proceedings and a party wants to keep that identity confidential, the party may serve and file an application for permission to file its certificate under seal separately from its principal brief, motion, application, or opposition. If the application is granted, the party must file the certificate under seal and without service within 10 days of the court’s order granting the application. Since when is it acceptable in America to sue a US citizen to silence them of a deceit in public health of which you are involved…and not even have to disclose that you are the one who sued them? The US Chamber of Commerce, the insurance industry and the Compromised Courts of California may not like us and want us to be silenced of what they have coluded to do to defraud the public. But OSHA likes us! They cited Katy’s Exposure Blog as a scientific reference as we exposed the false science over the mold issue that is adversely impacting US public health and workers’ comp policies. October 12, 2011 From Currents ex-CIA agent says government poisoned his family in moldy military housing and then claimed national security reason to conceal what they had done. This entry was posted in Temp and tagged acoem, Bryan Hardin, ccms, judicial council, Mold, NIOSH, schwarzenegger, US Chamber, Veritox. Bookmark the permalink. 1 Response to Is The California Court Case Management System (CCMS) Being Misused For Politics In Policy & Litigation…..And The Fleecing Of The California Taxpayer Over The Mold Issue?